This is the time of year when lamb is at its best. Grass-fed (as opposed to off season grain-fed) being the key to why “in season” lamb is better. Ask the butcher at your grocery store whether you’re buying grass-fed lamb – I promise that, like, 98% of butchers are really very friendly. Also go with fresh feta in the brine. 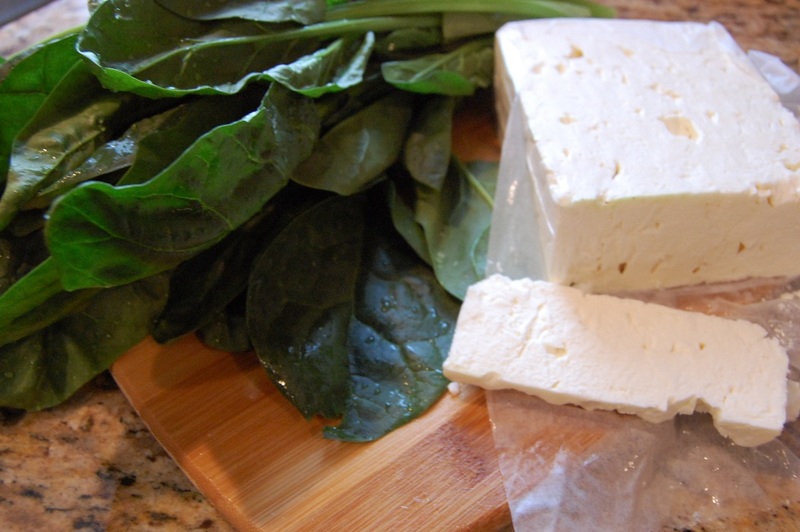 The grocery store that I go to has several varieties of fresh feta – domestic, imported Greek, imported Bulgarian, etc. Here’s what you need to know: feta has a Protected Designation of Origin attached to it, meaning the only product that can really be called feta is the sheep or goat’s milk cheese made in Greece. It tends to be a little more pricey but the flavor is unique and, in my humble opinion, worth the pennies. I can usually find it for about $7/lb – since we’re talking about 1/4 lb in this recipe, the price isn’t terrible. I like words like “meatball” that describe quite literally the item they name. A ball of meat. It’s too bad other shapes don’t work, because I’d like to see meatcubes and meatpyramids solely for linguistic reasons. Keep in mind that you don’t want to over-handle the meat (like any ground meat). 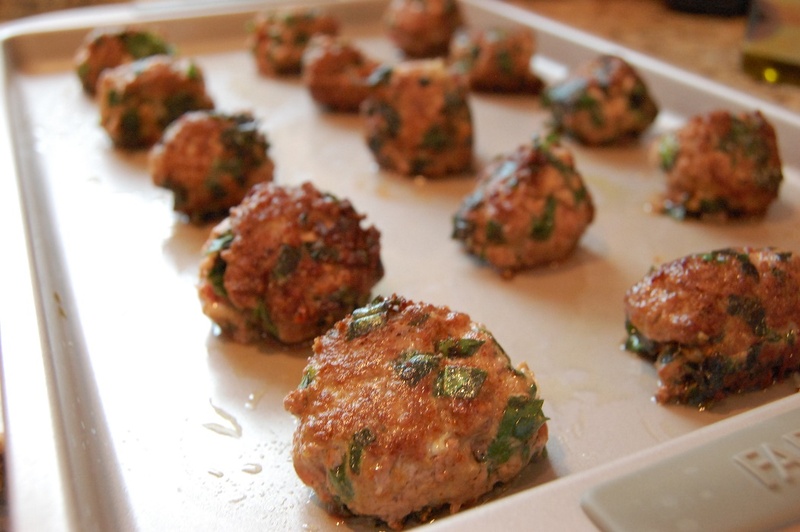 Don’t fret over rolling the meatballs in your hand until they are perfectly smooth spheres. If you instead leave them a little jagged and bumpy, whatever sauce you put on them won’t go sliding off. Less perfect = greater flavor. You want to split your formed meatball wide enough to add a cube of feta. The difficult part is resealing that split so that the feta won’t melt out of the meatball while cooking. Your instinct will be to roll furiously, so I’ll say it again – don’t! Be patient and gentle and you’ll be rewarded with a tender, flavorful meatball. Step One of the cooking process is searing the meatball on each side. This takes mere minutes and seals in the juices of the meat so that they don’t cook out (and leave you with dry meatballs). Next you throw them in the oven for a few minutes to finish cooking. 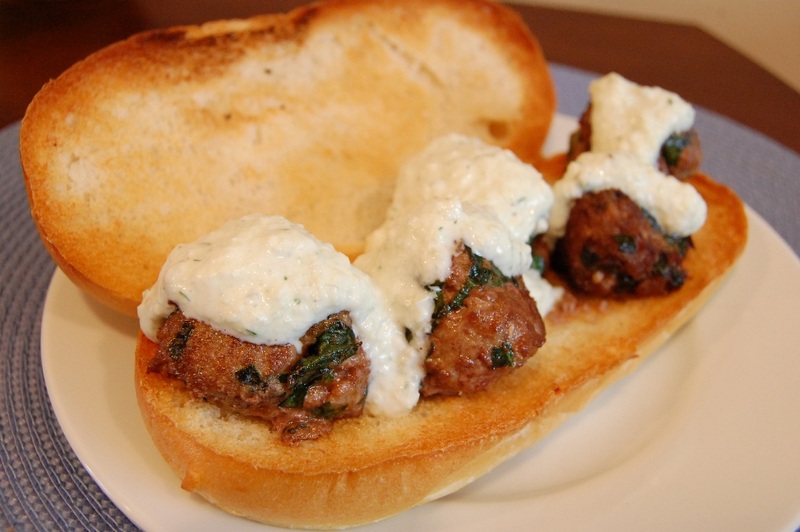 You’ll probably notice some feta cheese trying to escape one or two of the meatballs. Feta has a bit of an ego – it shines so well on its own that sometimes it doesn’t want to share the spotlight with others (like lamb, for instance…). But don’t you let that feta push you around – the final product will be great. Meatball sub, remixed. That’s some tzatziki on there, if you’re curious. 1. 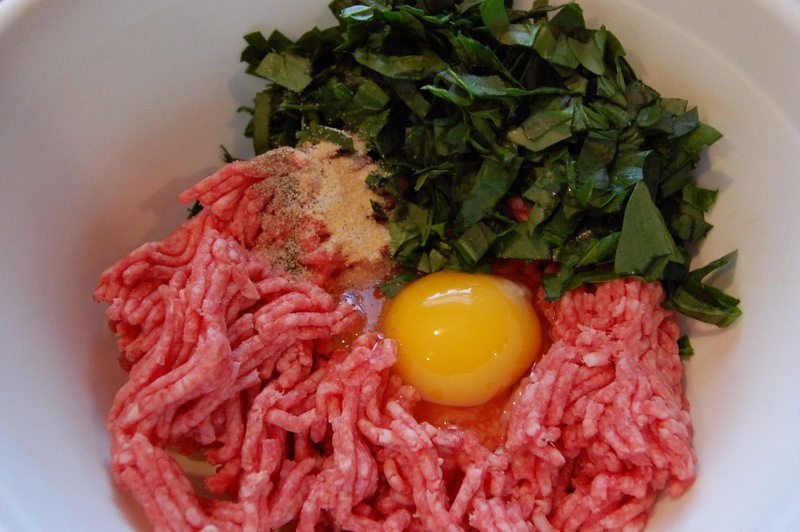 In large bowl, add ground lamb, egg, spinach and spices. Mix until combined but do not over mix. Form into 1.5 – 2 in balls. 2. Dice feta cubes small enough to fit inside the meatballs. 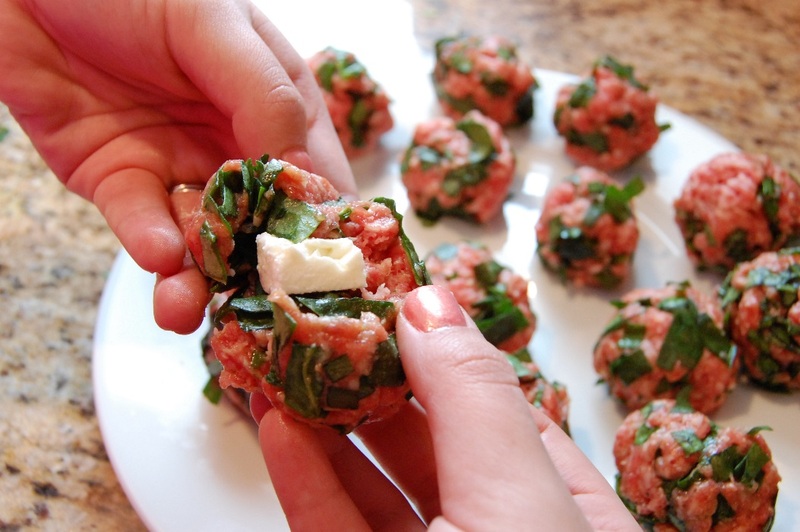 Split each meatball halfway (do not pull apart entirely) and add a cube of feta. Reseal the meatball to keep the feta from melting out during cooking. 3. Preheat oven to 350 degrees F. Heat olive oil in pan over medium heat. 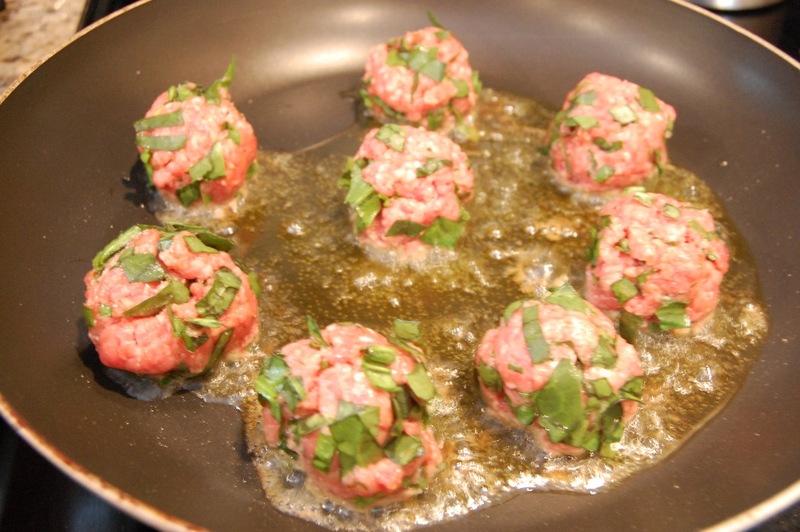 Add meatballs and sear each side until browned, but not cooked through. Remove from heat and place on cooking sheet very lightly coated with olive oil. 4. Bake in oven for 5 to 10 minutes until cooked through. 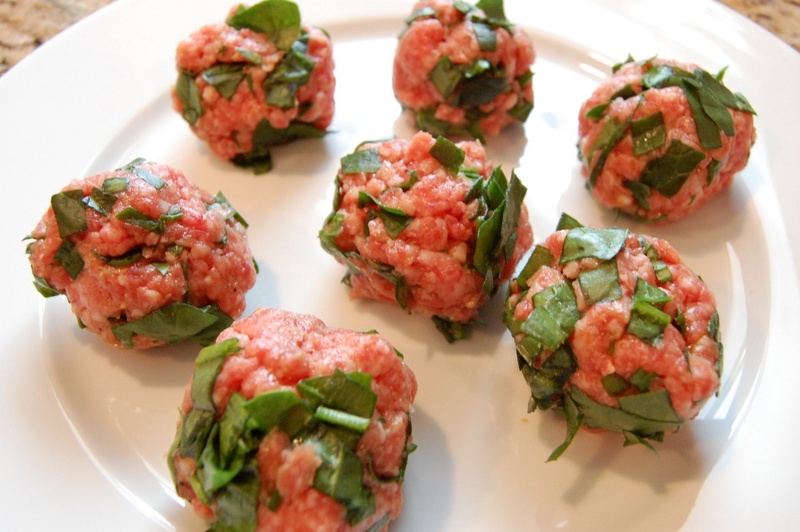 Meatballs should “spring back” when pressed with fingertip (if unsure, test for done-ness by cutting into a meatball – there should be no pink left). Optional: serve with tzatziki on sub bun. 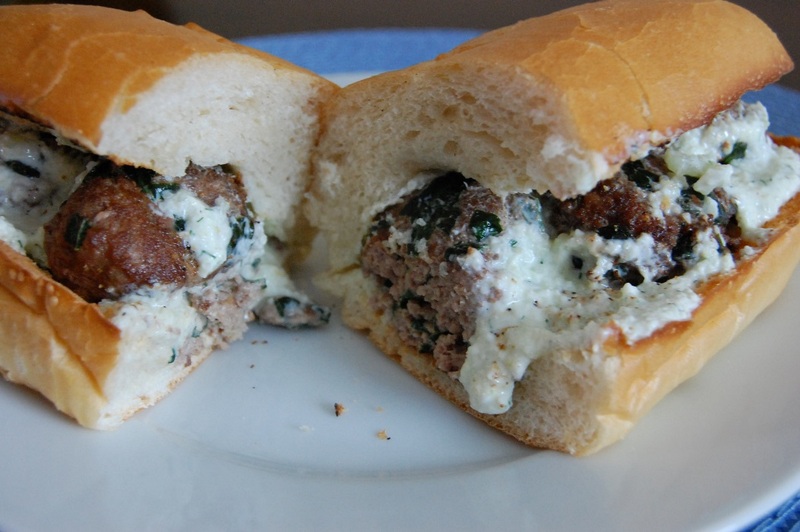 This entry was posted in Appetizers, Dinner, Meat and tagged Cook Time, Cooking, Easy, Fast, Feta, Ground Meat, Lamb, Meatballs, Prep Time, Quick, Recipes, Simple, Spinach, Tzatziki, Yield by Lazy Suzan. Bookmark the permalink. Great recipe and an even better sandwich! That looks fantastic! Good advice, too, bout not over-working ground meat. These meat balls are meant to be tender. Thanks for sharing. Thanks! Do you ever make lamb? Have a favorite recipe? Yes, I cook lamb frequently but there’s nothing fancy about it. It’s in the Mediterranean style my family used with garlic, rosemary, olive oil, salt & pepper. I am making these tomorrow or should I say today because it is after midnight, for me and my buddy. He is a major foodie and is always making me crazy stuff that is so good (just made me shrimp tamales monday night) so I try and show him up every now and then. I am very excited. I will do the tzatziki from scratch as well. I will pair it with some Quinoa. I am so excited!! How did they turn out?! Thanks for stopping by! Looks like my feta is sealed and I’m going to have to try this one. Unfortunately for them, none of my kids likes lamb.